Weed and feed products, typically named as such, go by other names including turf builder with weed control. 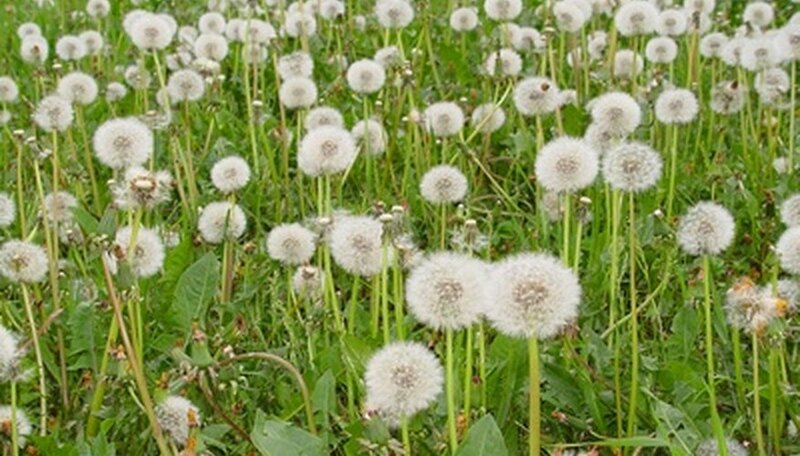 Manufacturers of these products including Scotts, Sta-Green and Vigoro claim weed and feed kills as many as 175 weeds, including dandelions, chickweed, knotweed, thistle and many broadleaf weeds. It also encourages greening, increases the lawn's ability to absorb water and nutrients and extends nitrogen feeding. Use a few application tips for the best results. Vigoro, a manufacturer of weed and feed products, recommends watering the lawn before application to assist the product in sticking to the grass. Wait to water again for 24 to 48 hours after application. The exception to this rule is when using weed and feed products for certain Southern, grasses such as zoysia, St. Augustine, centipede and carpetgrass. Products specifically formulated for these grasses, which typically contain atrazine, require that you water the grass immediately after application. Wait until early spring or fall to apply when broadleaf weeds are growing. Apply on days with little wind to assist with even coverage and prevent over-spray on surrounding landscaping. Do not apply after temperatures consistently remain at 90 degrees F.
Mow your lawn two days before weed and feed application to stimulate weed growth. Mow the lawn at normal height, not lower or higher. Do not mow immediately before application or you will suppress weeds, which prevents the weed and feed product from having direct access to the weeds. Measure the width and length of your lawn in feet. Multiply the width by the length. This is the square footage of your lawn. Measure the square footage of any non-lawn areas including your garden, deck, patio, garage, driveway and the home. Subtract those square footage totals from your lawn's total square footage for an accurate number to use in determining how much weed and feed to purchase and use. Keep everyone except the applicator, especially children and pets, off the treated area during application. Continue to keep pets and children off of the treated area until the weed and feed product has been watered in and the grass has dried. Store weed and feed out of the reach of children and pets as it is harmful if swallowed. Apply weed and feed with a lawn spreader. Weed and feed application instructions printed on the bag typically list several different types of spreaders and specify which setting you should use on your spreader. Follow the specific instructions provided with your weed and feed product as they may vary among manufacturers.